Buenos Aires takes some energy to explore, but you'll fine plenty of places to relax and take it easy. 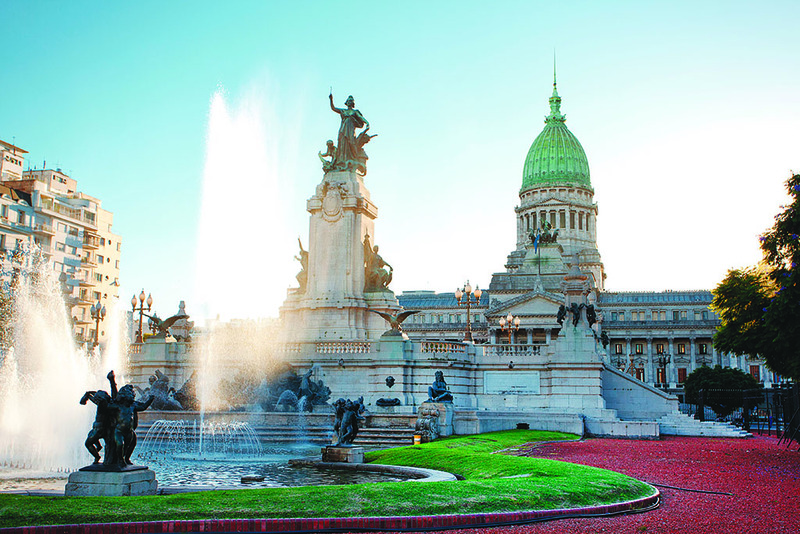 We’ll start at the heart of Buenos Aires: Plaza de Mayo. Located at the center of the Microcentro (downtown) district, it’s a good place to begin getting a feel for this dynamic metropolis. There’s bound to be a demonstration of one kind or another here (including, in November, the spectacular Gay Pride Parade). 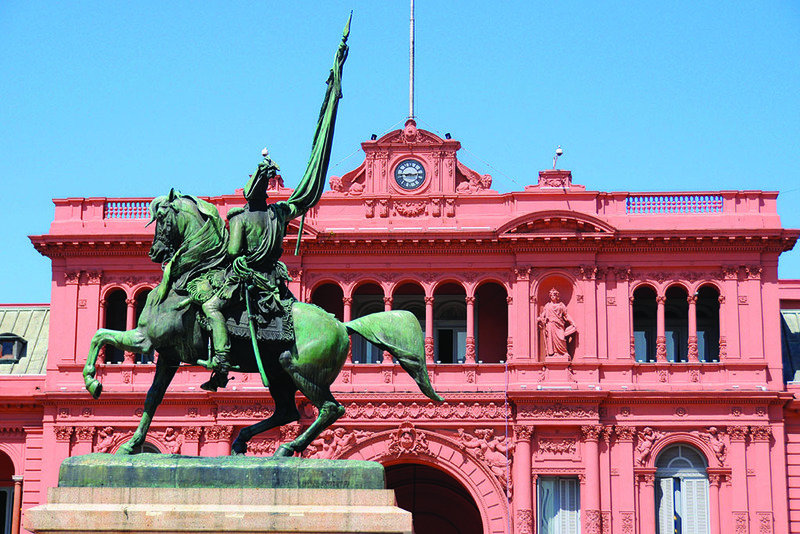 At one end of the plaza is the Casa Rosada (the aptly named Pink House), the home of Argentina’s presidential offices. Look at the elaborate balconies. If it seems familiar, it’s because this is the classic “Don’t Cry For Me, Argentina” shot, and, as you stand in the plaza, you can just imagine Eva Perón (okay, Patti Lupone) on one of those balconies. Take a tour of the building (it’s open to the public on weekends for guided visits, including English-language tours) and then explore downtown. A few blocks from the plaza, introduce yourself to BA’s coffee culture at Café Tortoni, the oldest coffeehouse in Argentina. The long, narrow space looks just like a coffeehouse should: long rows of pillars, marble-topped tables, and leather-cushioned chairs. It’s the first place I go in Buenos Aires, and a café con leche, along with three little medialunas (Argentina’s croissant, which is much denser and sweeter than the French one), shows me why this place has been thriving since 1858. While it’s mostly tourists these days, the black-coated waiters and classic atmosphere give my day a much-needed boost, and the jet lag seems to melt away as I sip the rich, sweet brew. 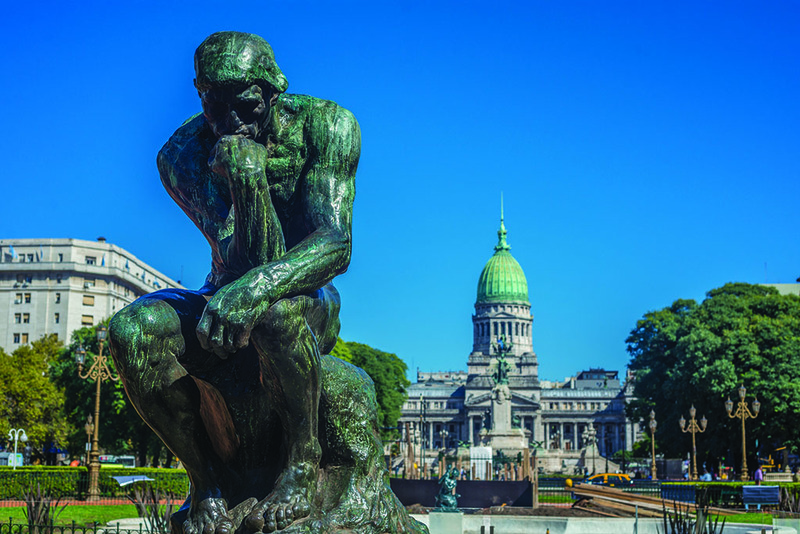 There aren’t a whole lot of other “sights” here in the center, as it’s mainly a business district, but it’s a great place to start getting a feel for Buenos Aires. I love just strolling along wide-open Avenida de Mayo, past balconies with wrought iron rails, stone balustrades, and black and white mosaic sidewalks. There’s a feeling of Europe here: the city feels less Spanish than Parisian, or über-European, both in design and ambience. Near the Plaza, I stop in the cathedral, with its barrel ceilings, mosaic floors, and ornate altar. I look again at the Casa Rosada. Then I start exploring for real. Heading south from the Plaza, you’ll arrive in San Telmo, a gritty kind of place where graffiti adorns walls of cobblestone streets and belle époque buildings sit side by side with modern apartments. As I walk down Avenida Balcarces, a couple passes by dressed to the nines (in the middle of a weekday), and I wonder where they’re heading. Seconds later, a middle-aged woman with blonde hair not found in nature careens down the street muttering to herself about a guy who stole her Ipod headphones. Still shaking my head, I look up and I’ve literally stumbled upon Pride Café, a little gay coffeehouse with a sweet staff and a nice feel, where you can take a café con leche inside or have a sandwich or a fuller meal on the patio, shaded by large umbrellas. Afterward, I discover the Mercado San Telmo, an indoor market that combines fruit and vegetable stands with antique stalls so that you never quite know whether you’re going to come across a pile of tomatoes or a silver tea set. I stop for a pick-me-up at Coffee Town, a little stall in the market offering the best espresso in Buenos Aires, a city that for all its coffeehouse culture isn’t overwhelmed with good coffee. Here at Coffee Town, the rich, deep espresso is the perfect energy boost for the overwhelming nature of the market. I wander past stalls holding china espresso cups, weird vintage dolls, old radios, ice tongs, butter dishes, jewelry, and crystal wine goblets. I pause in front of an impressive display of antique scales until reality sets in, and I realize they wouldn’t exactly fit in my luggage. This is nothing compared to the Sunday Flea Market, a San Telmo event held on a pleasant plaza right outside the Mercado. You’ll find the usual range of flea market merchandise, from china, crystal, and silver to just about anything else you can imagine: old license plates, antique maps, antique cameras, tall candlesticks, bellows, tea pots, and tiles. It’s amazing to see, covering the entire square and featuring a crafts market that stretches the length of Defensa, San Telmo’s main drag. In San Telmo, antiques sit side by side with the most vibrant street art in creation. I’ve never seen such elaborate murals, ranging from a pair of giraffes and a muscular, devilish man to a panorama of flowers and butterflies. Every corner you turn is like an alfresco art gallery (call it the Mural and Graffiti Arts Museum), and while you’ll find similar decorations all over town, San Telmo for me is the heart of this most effervescent of arts.